This Artichoke Tomato Chicken is a super easy meal that can be on the table in less than 30 minutes! Fresh herbs, tomatoes, chicken, artichokes and cheese make this one easy meal your family will be asking for again and again. Welcome to an easy weeknight meal! I really don’t think this dinner could be any easier, folks. There are probably more than 50 chicken recipes here on 365 because we eat a lot of it. I think I am now officially tired of eating it, so it may be a while before their is another chicken post. but I think just plain ol’ Artichoke Tomato Chicken is the way to go. The family really liked the Tomachoke, but it doesn’t sound too appetizing and like you’re going to be taking a trip to the hospital once you take a bite. 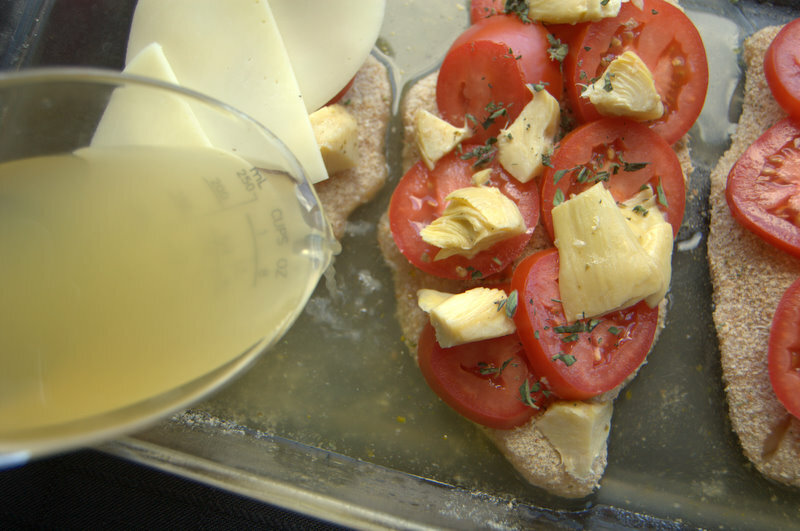 Fresh herbs, tomatoes, chicken, artichokes and cheese, make this Artichoke Tomato Chicken a super easy meal that is on the table in less than 30 minutes! Preheat oven to 425 degrees F. and prepare a 9 X 13? baking dish by spraying it with cooking spray. Place bread crumbs into a shallow dish. Using one breast at a time, coat on both sides and place in prepared baking dish. 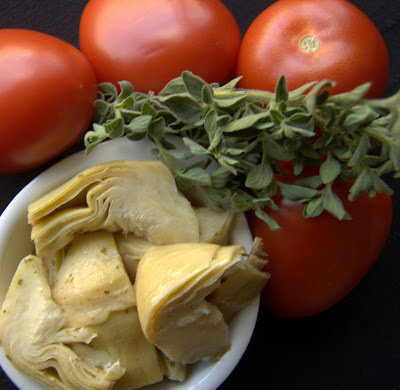 Place tomatoes and then artichokes on each piece of chicken. Evenly sprinkle the basil and oregano over each chicken breast. 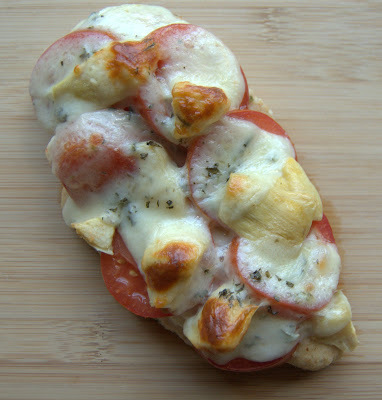 Slice provolone cheese and half and place 3 slices over each chicken breast. Gently pour chicken broth into dish. There you have it, dinner. This was a quick and easy dish and the cooking time was spectacular! Can I say that cooking or rather, baking time, was spectacular? Seems a little outrageous, or over the top, hunh? It was so short and convenient. Served this with a spinach salad and baked sweet potato and we had one awesome dinner! I rate everything I bake on a scale of 1-4 with 4 being the best and this Artichoke Tomato Chicken earned 3 rolling pins. The artichoke, tomato and fresh herbs added a lot of flavor to what would have been plain chicken. The broth that it baked in kept it really moist and the cheese was an added bonus. A quick dinner with lots of flavor, what could be better? Well, perhaps a good drink to follow. I love this! We eat chicken a lot in my house too and I think I will have to try this out for sure! 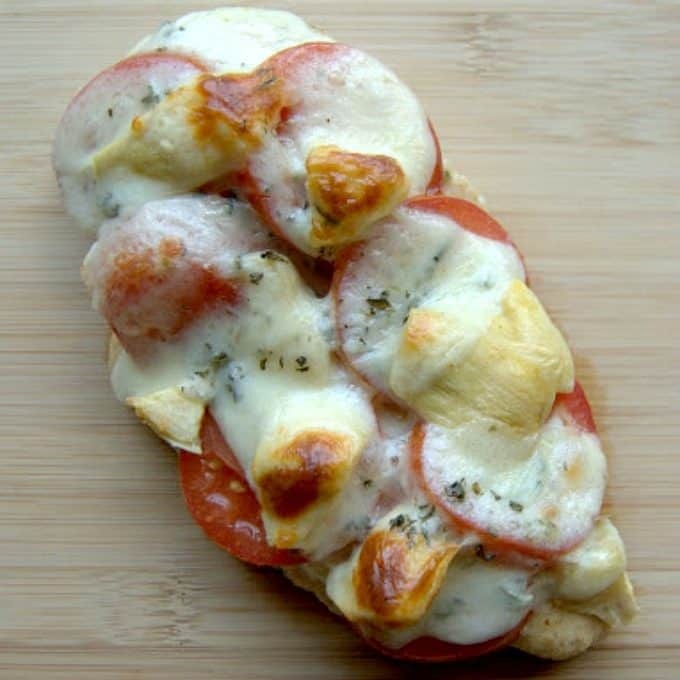 This looks really delicious! I went to college 3 hours from home. Sometimes, I would walk out of class and mu mom would be waiting just to take me to lunch and then she would go back home! Ooo. This sounds amazing! I think a little pesto would be delicious on this! Each bite must be heavenly because this looks divine! Thank you! Di, it does taste really good and it’s an amazingly easy dish to make, too!